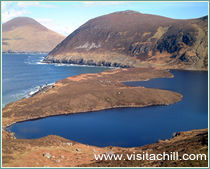 One of the most remote, and dramatic, places on Achill Island is Annagh. Located on the northern coastline of Achill, this steep sided valley with spectacular corrie lake and small, sandy beach is only accessible by foot over hills or by boat. The corrie lake at the heart of Annagh - Lough Nakeeroge East - is just 16m above sea level and is the lowest corrie lake in Ireland. A fine example of a glacial corrie lake, its moraine separates this freshwater lake from the seawater of Blacksod Bay to the north of Achill. Annagh has a long history, and a a megalithic tomb discovered in the area suggests habitation up to 5000 years ago. The remains of a booley village are located to the west of the lake at Annagh. Booleying, or transhumance, refers to the practice of living in one location for part of the year - for instance, to tend cattle in summer pasture - and another location for the rest of the year. Achill is one of the last places in Europe known to practise booleying. One interesting feature of the booley village at Annagh is a circular stone hut which may have been a 'sweat house'. These were primitive saunas and would feature a fire inside the structure. They were used to treat people with rheumatism.